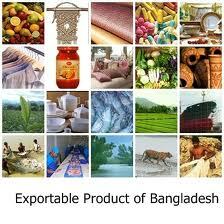 This term paper focus to explain Exporting Products Positioning of Bangladesh. In this report briefly concern on leather products of Bangladesh, its present and futute condition and side by side its export potential. Other objectives are discuss contribution and future prospect of lather products sector and understand its advantages and market share. Here also focus to compare its contribution with other export sectors and analysis about international business. Finally analyze to know about BFLLEA and its activities exporting products positioning.